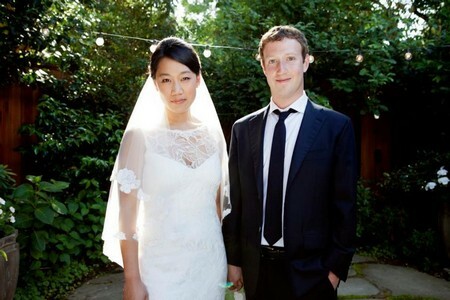 Priscilla Chan married Mark Zuckerberg today in a small, intimate ceremony. Priscilla is originally from the Boston suberbs and met Mark at a party put on by his fraternity during his sophomore year at Harvard. They began dating in 2003. Priscilla moved in with Mark in his Palo Alto house. Priscilla recently graduated from medical school at the University of California, San Francisco. She plans to be a pediatrician. After being engaged for almost a year the couple got married today. Guest invited thought they were going to a celebration for Priscilla graduating from UCSF medical school but instead when they got to the event it was a wedding. People reports: Guests dined family-style on food from the couple’s favorite restaurants, Palo Alto Sol and Fuki Sushi. For dessert, they had Burdick Chocolate “mice” – whimsical chocolate treats made in the shape of mice – which the couple had on their first date. Congrats to Priscilla and Mark!